Sears’ Edward Lampert was a wizard. Now he’s coming to terms with failure. One-time Wall Street wunderkind Edward Lampert's stubborn commitment to Sears has cost him billions in personal wealth, not to mention the damage to his reputation. By age 25, Edward Lampert was already a Wall Street wunderkind, celebrated for his intellect, ambition and prodigious work ethic. The famed investor Richard Rainwater, the billionaire Hollywood mogul David Geffen, and Michael Dell and Thomas Tisch were among the prominent backers who gave him more than $200 million in startup capital. At 28, he was the subject of a front-page profile in The Wall Street Journal headlined “The Climber.” His hedge fund’s 29 percent annualized return landed him on the cover of Businessweek in 2004. Forbes pegged his net worth at $3.5 billion in 2005, ranking him 61st on its annual list of the richest Americans. Then he bought Kmart out of bankruptcy and merged it with the venerable Sears. His investment: Lampert’s reported $700 million investment in Kmart through his hedge fund became worth $5 billion after it merged with Sears. That’s virtually worthless after the bankruptcy, and so are the loans he made to Sears. But Lampert acquired some Sears assets – like store properties – in recent years. He’s also proposed buying Kenmore, the Sears appliance brand, for $400 million, and last week said he hopes to buy 400 profitable Sears and Kmart stores. With the bankruptcy this week of Sears Holdings, which he has run as chief executive and chairman since 2013, Lampert, now 56, was back on the nation’s front pages. The coverage has been as damning as it was once fawning. Lampert has become the villain, accused of pillaging and destroying an American retail icon to further line his already stuffed pockets. If that was his intent, it was a singularly inept effort. 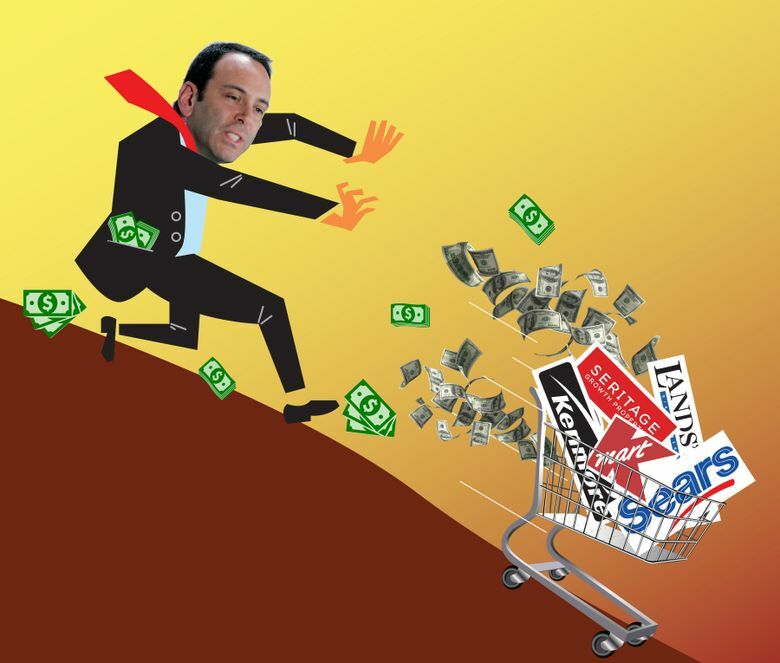 Lampert’s steadfast — many would say stubborn — commitment to Sears has cost him billions in personal wealth, not to mention the damage to his reputation. Nearly all of his early investors have abandoned him. His hedge fund’s assets have dwindled. Last year, one of his staunchest backers, the hedge-fund manager Bruce Berkowitz, bailed out, saying that Sears had “wrecked” his hedge fund’s returns. The decline of Sears “has been hugely frustrating and fatiguing for me to watch,” Berkowitz told his investors. Thanks to his early successes, Lampert is still very, very rich; his fortune today is estimated at $1.1 billion, according to the latest Forbes survey. He will likely emerge from the Sears collapse with many more assets than most people realize. He owns lavish homes in Greenwich, Connecticut, and Indian Creek, Florida, just off Miami Beach. But he no longer makes the cut for Forbes’ 400 richest Americans. His net worth has plunged by $3 billion since peaking at $4.5 billion in 2007, the magazine estimates. At Sears, all of his compensation was in stock. He never sold a share. The stock is now all but worthless. There was widespread skepticism when Lampert first merged two once-popular but struggling retailers in 2005. On one flank was the mighty Walmart. On the other was the fast-growing Amazon. Sears lacked Walmart’s economies of scale and Amazon’s digital reach. But Lampert knew that great fortunes aren’t made by following conventional wisdom. The opportunity that Lampert, but few others, saw was the combination of Sears’ brands and customer loyalty and Kmart’s attractive real estate, most of it in prime stand-alone locations rather than within aging malls. That promise seemed to be borne out in the early years. But the financial crisis and the collapse of the housing market hit Sears’appliance and housewares sales. Sears never regained momentum. By 2009, Lampert said, he realized that nothing less than a radical transformation of Sears’ culture would allow it to keep up with the digital revolution that was transforming the retail industry. That year, he launched the store’s ShopYourWay campaign as the cornerstone of a new data-driven and customer-focused strategy to compete with Amazon. That’s where Lampert met his match. He said he didn’t pick the best executives to fully embrace the company’s digital makeover. “I underestimated how difficult it is to do and how critical are the right people to lead and to get people to buy in,” he said. As one example, he cited his attempt to convert underutilized space into internet lounges, which offered customers free Wi-Fi and a place to relax. It was an attempt to get customers, many of whom didn’t have internet access at home at the time, into stores, much as Starbucks had attracted laptop-toting coffee drinkers. This was anathema to traditional retailers, who measured success strictly in terms of sales per square foot and for whom any space not dedicated to merchandise was a waste. Nonetheless, the computer-equipped internet lounges were rolled out in 100 Sears locations — but in a halfhearted manner. “I’d visit a store, and there’d be 10 computers,” Lampert recalled. “Half of them wouldn’t work.” The lounges were abandoned. “We didn’t have store leaders or a CEO at the time who embraced the idea,” Lampert said. By then it was too late. Caught in a spiral of declining sales, huge losses, store closings, forced asset sales and relentless competition from online rivals, Sears struggled for its day-to-day existence, a war of attrition that ended with this past week’s bankruptcy. It’s far from clear that successful internet lounges, or even an agile culture that embraced change, would have saved Sears. Lampert has reaped criticism for underinvesting in Sears’ physical stores; for trying to run the company from his Florida office, far from the company’s Hoffman Estates, Illinois, headquarters; and for a revolving door in the executive suites. In the end, though, none of that may have mattered much, either. Lampert insisted to me that ShopYourWay was showing promise but required far more time and capital than Sears could muster. “If I could have raised billions, I could have done things differently,” he said.